Sometimes things have to be reread in a different climate and context to be appreciated properly. Disparaging an idea is easy when there isn’t anything intellectually pressing you or requiring some sort of ethical and moral legwork on your beliefs. That also itself involves introspection and the willingness to analyse and identify mistakes. That is how, as an anti-Stalinist leftist, I view Nick Cohen’s “What’s Left” book. I initially read it as a teenager and found it hard to digest. I regarded it as dressing up imperialism in warm words of internationalist solidarity. The book did not have the imprint it deserved to. As it happens, it didn’t need to. The cannibalism of the left under the leadership of Jeremy Corbyn in the Labour Party has done that. If you read Cohen’s book you see it as a chilling dark prophecy on what was to come. A foreshadowing of ugly events and behaviours chronicled in an excellent book that explored the ugly heart of left-wing politics in the west. And from it, a morsel of enlightenment can creep upon you, a nagging realisation that there is something profoundly distasteful about the left today in how it views the conflicts of the world. As we speak, events are uncoiling rapidly in Venezuela. 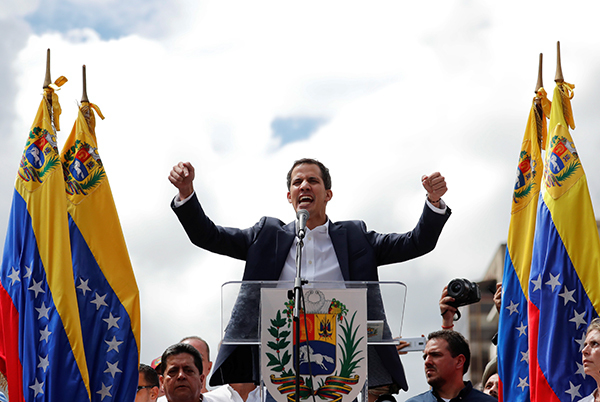 A push to remove the elected dictator Maduro by an opposition leader with considerable democratic legitimacy. It is something fervently supported by thousands of Venezuelans, exhausted with the industrialised levels of poverty and political corruption feeding into the country’s sickly nature. This is surely something the left should support. But many would look at the protesting masses and instead believe they have been whipped up by the CIA, and regard this all as a regime change pushed by America. The left regards its internationalism simply through the prism of struggling against American imperialism. This is not a new behaviour but one that accelerated after the disastrous invasion of Iraq in 2003, which seemed to obliterate from history any successful intervention that had ever taken place. America are seen as the unipolar force in the world, the spider at the centre of the corrupt web spinning the chaos of the global free market, pumping American propaganda everywhere. They are to be resisted. This is, in theory, a noble principle to be observed but its ethical collapse comes in the inconsistent application of resistance to dictators and imperialists. We live in a world of multipolar powers, and one of them includes Russia. The problem with viewing America as the sole cause of suffering is that it reduces other actors on the political scene to reactionary agents, no matter how barbaric they may be. We have seen this repeatedly where high-profile left-wing commentators have absolved Russia for blame in Ukraine or Syria, the latter witnessing a brutal genocide yet receiving limited support. And we have seen it with dictators across countries like Iran, Syria, North Korea, Libya, Cuba and Venezuela where an autocratic leader can generate international sympathy if they pin their grievances on the west. In Syria this had the double-edged effect of benefiting ISIS who could correctly say to Sunnis terrified of Assad that they were the only shield. In fact, the only time western leftists have protested violence in Syria has been to condemn air strikes on Assad’s murderous facilities. Likewise, in Venezuela they have ignored the terrible spread of poverty only to speak up now as Trump backs regime change. This is not internationalist solidarity with indigenous people. This is fidelity to their local oppressive structures, to the states rather than people. This is subordinating human rights, democracy and liberty to the sovereignty of the state, all essentially a production of postcolonial guilt whereby leftists felt morally obliged to prevent their countries ever getting involved overseas. This behaviour ultimately rewards three types of people: the extremists in the Muslim world who can claim they are the only salvation to those being hunted and oppressed by their tyrants. The dictators in their local strongholds who keep hold of power and project themselves as victims of American aggression rather than directly responsible for the suffering of their people. And it benefits Russia, whose quiet yet aggressive imperialist surges across the world continue to go unchecked because too many on the left misunderstand what it means today to be an internationalist. The problem with this behaviour is that it doesn’t just apply on a global stage but occurs locally too. In Britain, the tendency for the left to get in bed with Islamists over their shared anger towards America has left to the betrayal of liberal Muslims, Muslim feminists and ex-Muslims. The Labour Party is guilty of this, with local branches often accused of seeking Islamist votes and refusing to defend basic principles of liberalism and democracy. It is the culturally relativist left which sees no problem in theocracy and the subjugation of women and homosexuals because it is that of another culture. This is not solidarity, it is not internationalism. The rise in anti-Muslim hate in Britain is truly frightening and signals a dark road ahead for those committed to a more pluralistic and tolerant Britain. But let’s be clear: the threat to pluralism and tolerance doesn’t just come from the white far-right. It also arrives dangerously from Islamists who regard democracy and human rights as false desires, who disregard women’s rights and do not believe in homosexuality. They regard non-Muslims as inferior and would in all likelihood kill apostates. But we have no problem sharing platforms with them in the fight against racism and the Tories. This is not a distant observation but an opinion moulded by discussions and lived experiences. If you look closely at how the left warmly receives Islamists and ignores liberal Muslims and then how it supports tyrants and not the masses, you realise they believe democracy and freedoms to be too complex for us. We are a simpler people who cannot handle freedoms and need a ruler with an iron fist. If we want to build a cohesive coalition of support with the democrats, socialists and feminists of the Muslim world and the global south, we cannot only listen to them when their oppressors are backed by the Americans. An Iranian feminist is as valid in her struggle as a Saudi democrat. A Syrian communist is no less legitimate in their protests against their brutal rule than a Palestinian protester determined to end the occupation. Likewise, a liberal Muslim deserves an audience to their struggles against the Islamist as much as they do from a white supremacist.